New Physics, Sound and More in Update 9.14! Update 9.14 transforms the way tanks move around the battlefield, plus has new intense sound for a more realistic battlefield. Take a look below for the highlights, or check out the update notes for the detailed report. 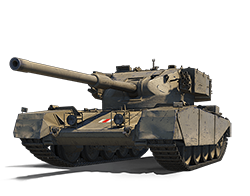 Improvements for the FV4202 (P) (tier VIII Premium tank)! Its dispersion at 100m has gone from 0.35 to 0.33m and aiming time from 2.6 to 2.3 seconds. And it's now available in the Premium Shop! Now you can skid, slide, flip tanks upside down and perform maneuvers you never thought possible in World of Tanks! Moving around maps is more dynamic and lets you be more precise with your speed and movements using the control keys. With the release of Update 9.14, you'll notice a huge difference in the way the game sounds. We've moved to the Audiokinetic WWise sound platform, making the sounds more informative and realistic. The sounds you hear will actually help you understand what's happening in battle without even seeing it! All the new sounds added in Update 9.14 were recorded using authentic vehicles at a real proving ground! You can now hear details like never before, including gearbox shifing, ricochets and shells passing by. Update 9.14 also brings some other features making aspects of the game more comprehensible for new and even veteran players. We added the option to see your view range, maximum spotting range and draw circle on the minimap. Personal Reserves are now available in all game modes, except for Battle Training, Tank Company Battles and Training rooms. We've simplified the way low-tier vehicles and their modules are researched, helping new players understand how to move up through the tiers. We've reworked 24 vehicles in HD quality, including the IS-6. We've further explained how this change affects it on the forum. See here for all vehicle changes.